I'm really enjoying the Google Teacher Tribe podcast with Matt Miller and Kasey Bell. It's an informative mix of Google news and tech-teaching ideas, and it's sure to enlighten at least one drive home every week. 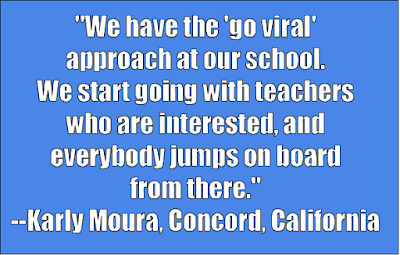 "We have the 'go viral' approach at our school," Moura said. "We start going with teachers who are interested, and everybody jumps on board from there." This is a strategy I've tried to embrace ever since I began teaching. 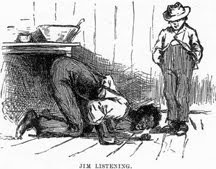 One challenge that I had early in my career was reactions from older teachers. This tended to be about "turf" and not getting "shown up," which was never a concern for me. Put the resources where they will go viral. Sadly, in many schools around America, there are excess computers sitting in classrooms, not being used, while teachers go about teaching the way they've always done. Instead of distributing one computer to five classrooms, administrators can put five computers in one room and let the "viral teacher" develop the kinds of lessons that will increase demand among students--then parents--then all the other teachers. Reward without rewarding. Viral teachers put in hours of personal time learning new apps they can use in the classroom. What do they expect from this? It certainly isn't a fat bonus check. What would really be great is paid time to learn. Districts and schools already have funds available for professional development and travel. 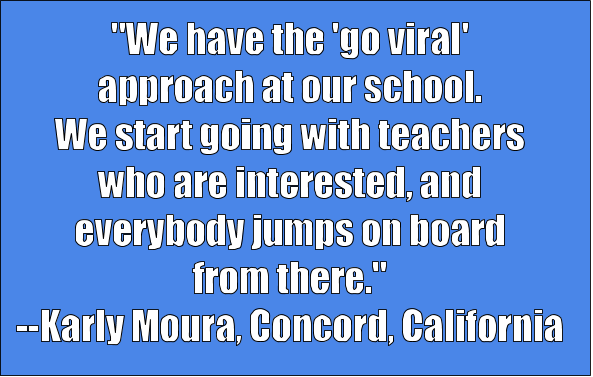 Instead of paying those funds to drop-in speakers--or sending a district administrator who hasn't taught a lesson in five years--a better investment would be in identifying the school/district's most "viral" teachers, and sending them. Spend time with the Viral Teachers. My poor administrators have so many boxes to check, but there isn't a box for "innovation" or "virality." For example, I had been experimenting with Google Classroom all year, building up my abilities, and I was thrilled to see a vice-principal come to my room last week (the first in February, 24 weeks into the school year). She observed me teach the class, and I took time to show her some of the workings of Classroom. In the end, though, she had the same boxes to check as for any other teacher she observed. I wasn't able to get feedback on the unique learning that I demonstrated.